A selfie posted to the Facebook of the Gainesville Police Department in Florida Sunday went viral after attracting flirtatious comments. 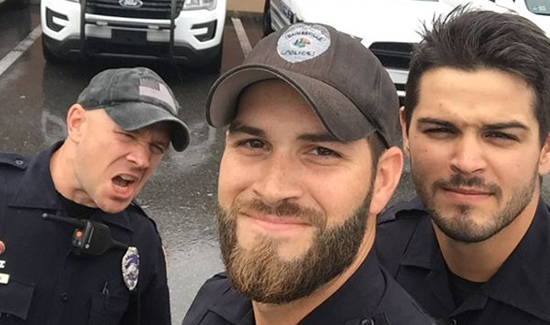 Captioned “Officers Nordman, Hamill and Rengering … part of the night crew getting ready to do some work,” the selfie of three officers had over 80,000 likes and 66,000 shares as of Tuesday afternoon. 1. We are dying with the comments. You’ve actually made our chief blush with some of them. 2. MRS. Nordman and MRS. Hamill have also enjoyed knowing how millions of women are going crazy over their husbands. 3. We can confirm that Officer Rengering (far right with the amazing hair) IS SINGLE. 4. On another note, Officer Rengering is being placed into Cougar Prey Protective Care, similar to the witness protection program for his safety. 6. There WILL be a calendar. “Thank you for all the hilarious comments,” the update continued. “They have brightened up our time here.